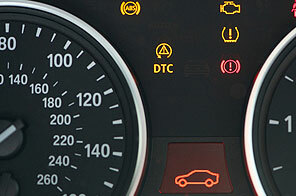 Have you noticed a light that doesn’t go out on your dashboard while driving or noticed a sudden increase in fuel usage? If your answer is yes, your vehicle’s computer system might have logged a problem that you are unaware of. The only way of discovering if there is a problem, is by using a mobile computer that carries out a diagnostic check on your vehicle. To give you peace of mind and safety, we can diagnose potential problems linked to the electronic system of your vehicle from only £45. The average family car may have as many as 20 microprocessors located around the vehicle. These processors are constantly monitoring and where necessary adjusting the operation of the vehicle while you’re driving. In the past when you noticed high revving, spluttering etc. you rushed to the garage. Today, your on-board diagnostic system is constantly making adjustments so you may not know you have a problem. With a regular diagnostic health check you can avoid costly bills before a crucial breakdown happens.